I am in some cases, a cautious person - not in everything you understand but certainly when it comes to decoration in furniture. I am a firm believer in the "less is more" school of thinking. It is all too easy to get carried away with the temptation to show off your skill in a very obvious way, whether it be with through joints, contrasting timbers, or decoration. Subtle is a good word - in the dictionary, it has three different definitions: capable of fine distinctions; delicately complex and understated; and making use of clever and indirect methods to achieve something. My favourite explanation is the last one, which brings me to the subject of fine inlay, or more precisely, stringing. This to me is a trick modern makers seem to have missed. It can if used carefully, be a delicate but striking way of enhancing your furniture without over egging the pudding, just adding a little bit of grace to your stunning piece of design. Wood is an extremely rich material as we know, and as makers we naturally choose the most elaborate pieces for the showcase positions like tops, sides, and fronts of cabinets. So we choose the richest cuts too: burrs, spalting, ripple etc. The trouble with this is that sometimes when you have selected all those wonderful bookmatched panels or those sequential cut drawer fronts, they can look, in my opinion, just too much, heavy, and too rich. This is where a delicate line of inlay can save the day by subtly framing a wild flamboyant figure and giving it definition. Equally, some not so interesting figure can be brought to life by that thin white line, or even a black one. So now having done my soapbox bit, how do you go about achieving inlay? I like to keep my stringing fairly thin, about 1.5mm (1/16in), as it is more subtle and delicate (there's that word again). For most of the inlay work I have done, I like to use old technology, so a scratch stock is the order of the day. 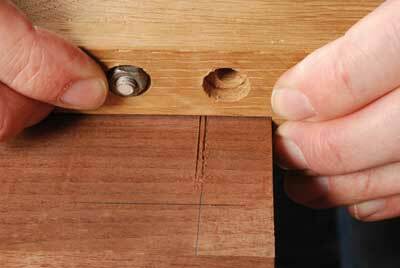 I have used a router before but personally, I prefer to do this by hand. It is more time consuming but safer - if you slip with a router it's much harder to correct than a slip with a scratch stock. This is where I start by making my cutter for the scratch stock. I use old broken bandsaws, so don't throw them away - they are soft enough to make your shape by using a file, but hard enough to do the job. Make a cutter to the width of the inlay you want then using a triangular file, cut a V-groove - this makes a double winged cutter, which means it will score as it cuts, giving a clean finish across the grain. I then tickle the two wings on a fine stone to give it a nice, sharp edge. I like to cut my own stringing - if you have the time and inclination, it is more fun. It is not hard to do, you just need a good, well set-up bandsaw. Choose a straight piece of stock - obviously you don't want any short grain or knotty pieces that will break up when cutting the fine section required. I use a rip type blade to cut the initial thickness. You need to allow for cleaning off and the depth of the groove, so I usually have a 2mm (5/64in) deep groove and allow the same to clean off. Plane a face and edge on some stock about 25mm (1in) square. 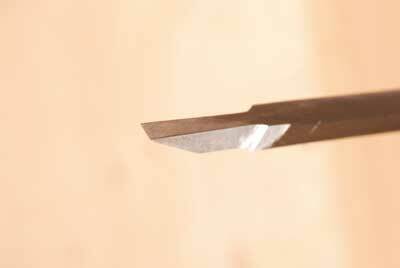 Cut several strips, cleaning up the face each time, of course, and always cut a little extra than you think you need. 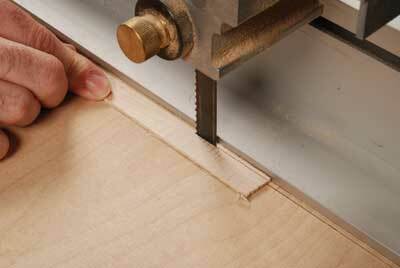 For cutting the inlay strips, change the bandsaw blade to a finer tooth set-up. I make a false bed with something like 6mm (1/4in) MDF or ply - this makes for a cleaner cut because when you are cutting something this fine, the more support you can give it, the better. A finer mouth will also stop your stringing disappearing down the mouth of the table! I now concentrate on cutting the groove. 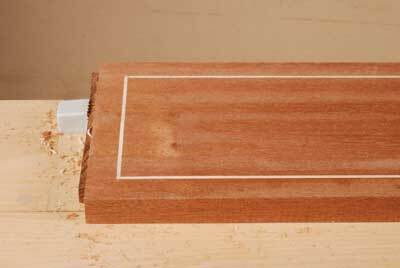 Once this is cut, I then cut the inlay to a close fit. Deciding how far the stringing is to be set back on something like a drawer front is a matter of personal taste but too far in will look strange, and too close will not give it that framing effect you are after. I start with the long grain parts first. 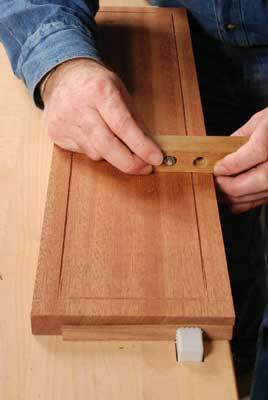 Mark out with a square the limits of your line from each end, and then use a gentle short motion, rather as you would use a marking gauge. To start with you are just marking out, so complete a whole line then start to deepen the groove gradually, a little at a time, working all the way along until you reach the depth you have set the cutter to. 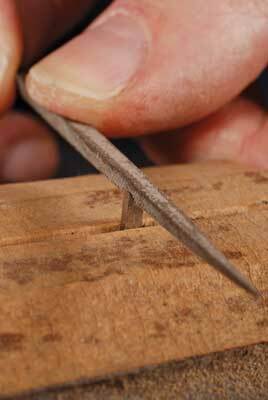 Once you have done this on both long grain grooves, it's time to tackle the cross grain ones. 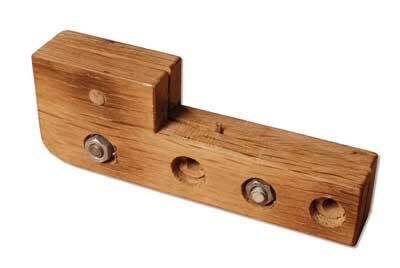 This requires more concentration and careful work - gently is the 'watch' word here. 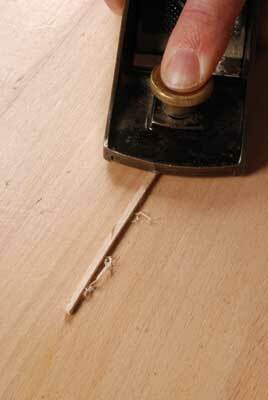 Again, use the cutter initially as a marking gauge to score your line and gradually deepen the groove. Once you have your four lines you will have noticed that you have a slight hill in the centre of you groove made by the V-shape of the cutter - this needs to be cleaned out. I make a special chisel to do this by either buying a modern 3mm (1/8in) chisel and grinding it to fit the groove, or you can sometimes find a second-hand chisel that is close, and do the same again. 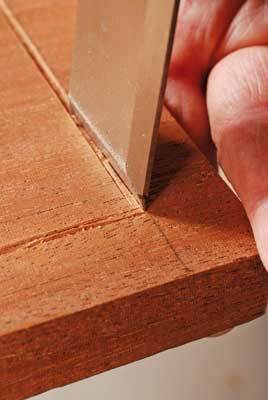 Cut out the corners using a large chisel and then clean the grooves using your adapted chisel, bevel side down. You will find that as you strip away the hill, this will give you an even depth. 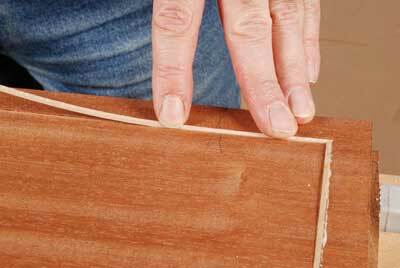 Work carefully all the way round until you have a complete rectangle of clean groove. Now back to the stringing itself. 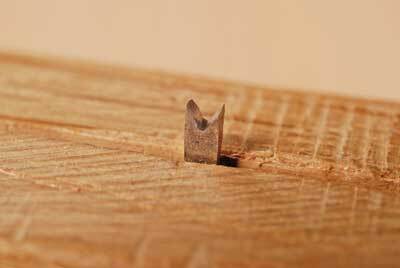 Cut close to the width of the groove. This will involve a little trial and error until you get it right. Now fit the long grain pieces using a low angle block plane, either holding it by hand against your bench, or using a G-cramp at one end and planing away from it. Do the same for the cross grain pieces. For the cross grain pieces, some makers will make stringing from cross grain material - for small widths I have found this to not be necessary, just using the normal long grain pieces. However for deep drawers or across a large top, you do need to be aware of the potential movement problem and I would use cross grain inlay in this instance. It is no harder to make, just more likely to break! Once you have all the pieces ready, do a trial dry fit. When you are happy with the fit it's time to get out the glue - I use something like Titebond or a standard white PVA. I start with the long grain, only putting glue in the section I am working on. Push in the stringing by hand to start with then using a ball peen hammer, smooth the stringing to its full depth by running it along the inlay using your weight to seat it fully home. Repeat this all the way round and leave to dry for a few minutes. For cleaning off, I prefer to use a plane - a low angle block or jack are good for this but take care not to knock off the inlay that is still proud with the nose of the plane. 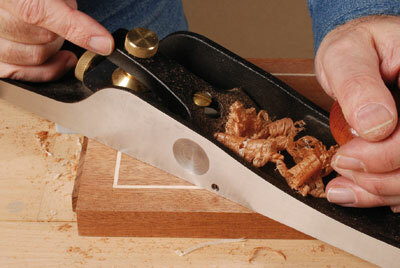 For some timbers like ebony, it can be better to use a scraper or a scraper plane. 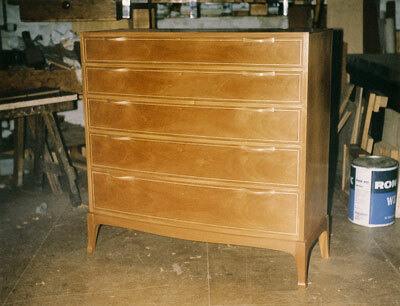 It is best to avoid sanding because with pale timbers like sycamore, you could end up getting the darker dust of your drawer front bleeding into it. Likewise, with darker inlay, it can bleed into paler timbers. This is a great technique that adds something a little different to your work - enjoy! "For most of the inlay work I have done, I like to use old technology"
I am sure the method I use for cutting the mitres is not unique, as I know John Lloyd uses it as well. However, this is the way I do it. I make up a cutting board that has two accurate sides at 90 degrees. Using a combination square, mark a 45 degree line. I use a fine black ballpoint pen as this shows up better than a pencil line. Using a nice wide chisel with a mirror polished finished back to it, place the chisel on the line and place the stringing parallel to one edge of the board and up to the chisel. 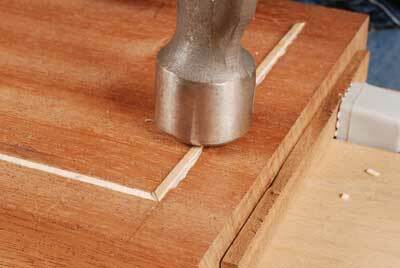 Keeping one corner of the chisel on the line using a pivoting guillotine motion, slice the inlay in line with your marked line. You will see a mirror image of the piece you are cutting reflected on the back of the chisel, acting as a visual guide. 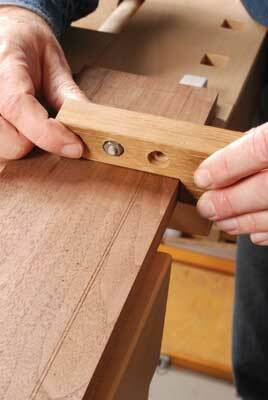 Repeat the process for the matching corner piece and you should have a perfect mitre! 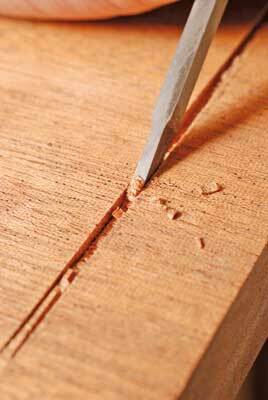 If it is a little out, the fine paring method of the chisel action makes it easy to adjust.